I usually ignore the competition. Watching the other guy can be a distraction, taking my focus off of the important things like taking care of clients and sharing my best advice. But analyzing competitor websites can quickly give you ideas for your own web marketing. 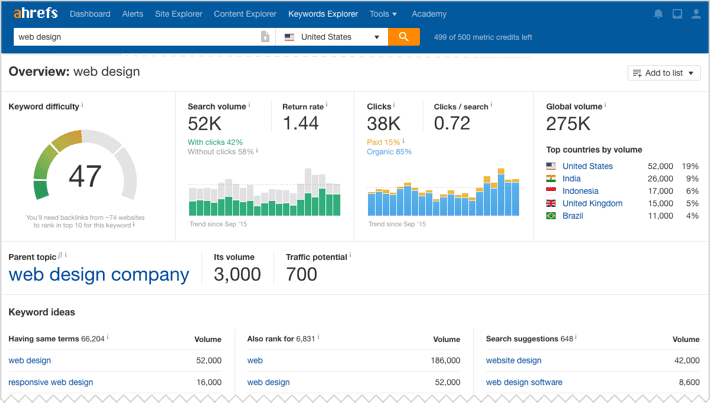 Of course, you can’t see their Analytics, but there are lots of free competitor analysis tools that will give you fast and valuable insights. 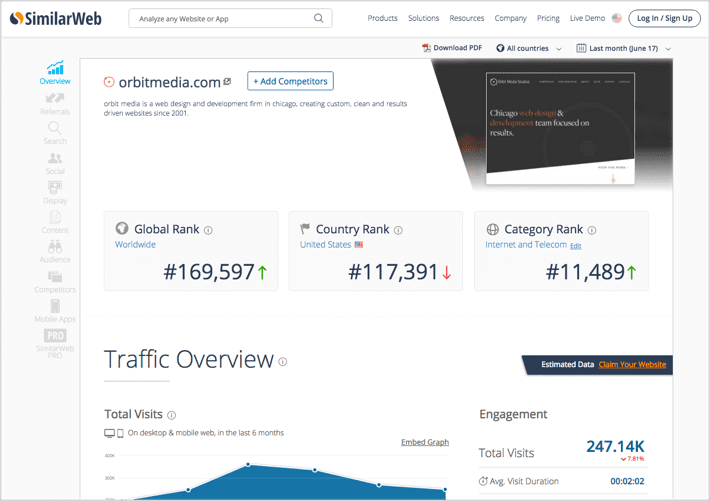 Here are 16 competitive analysis tools that you can use to compare your website to the other guys in many ways: search optimization, digital advertising, social media, traffic and technology. Here we’ll list them alphabetically, but you can see they have overlapping features. They all have free tools and more powerful paid versions. We’ve also shown how to do competitive analysis with each in the detailed descriptions below. Let’s break down each type of analysis. They each represent different aspects of digital marketing and criteria for evaluating websites. What do they rank for? What battles are they winning? And are we even in those same fights? Seeing what your competitors rank for and how high will immediately give you ideas for content and keyphrases. Without using a tool, the only way to find this information would be to search for every conceivable keyphrase. What phrases are they bidding on? Where are they investing their ad budgets? What do their ads look like? Similar to organic rankings, watching a competitor’s ad spending will give you insights into what might be a good investment for you. Assuming they have well-managed, well-optimized campaigns, you can see which words and phrases are getting traction with your target audience. How famous and trustworthy is their website? Are their pages more likely to rank than ours? Who can target the more competitive phrases? The next level of SEO competitive analysis is all about links. Sites with links from many other websites have higher authority, especially if the links are from sites that have high authority themselves. The original metric of authority is Google’s own “PageRank” but they no longer share this data. So these tools offer proxy metrics. Beyond the number, you can use these reports to find PR opportunities. If a media site or blog has mentioned and linked to a competitor, it may be a good site to pitch to yourself! 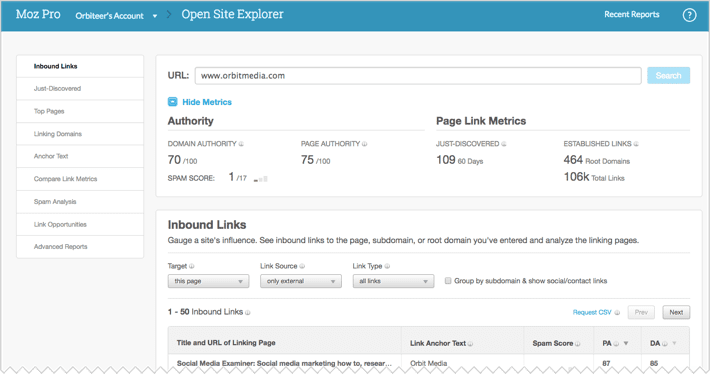 There are many tools that track links and provide authority metrics. Each has its own name for the number, but they all essentially measure the same thing: the likelihood of ranking and they all use a scale from 1 – 100. Which of their articles is getting shared the most? Which of their social networks is getting the best results? Who is sharing their content? Social accounts are easy to watch, but hard to analyze. At a glance, you can see which specific posts are getting engagement, but the big picture is impossible to see without tools. The insights are very useful and include ideas for what to write about, where to be active and who to collaborate with. If their site more popular than yours? Are they getting more traffic? Are their visitors more engaged? There are no tools that will give you an accurate look into their Analytics, but there are ways to get website traffic estimates. These tools give you a big picture, top line look into who is getting more visitors, when they visit, demographics and behavior data. What framework is their site built on? Is it WordPress? What tracking tools are they using? Website technology is surprisingly visible, and there are tools that make it easy to sniff out exactly what’s powering your competitor’s website and what tools and plugins are bolted on. This gives you visibility into what tactics they’re likely using and what might work well for you. Popular and powerful, we have to list this one first. 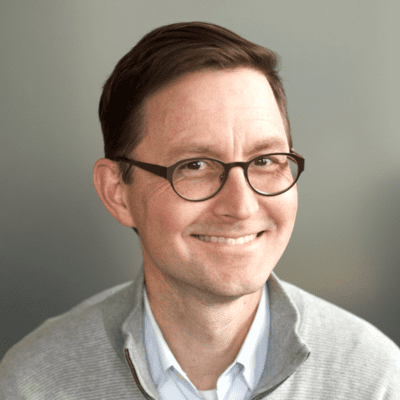 It’s the most recommended SEO tool on Robbie Richard’s survey of top SEOs. 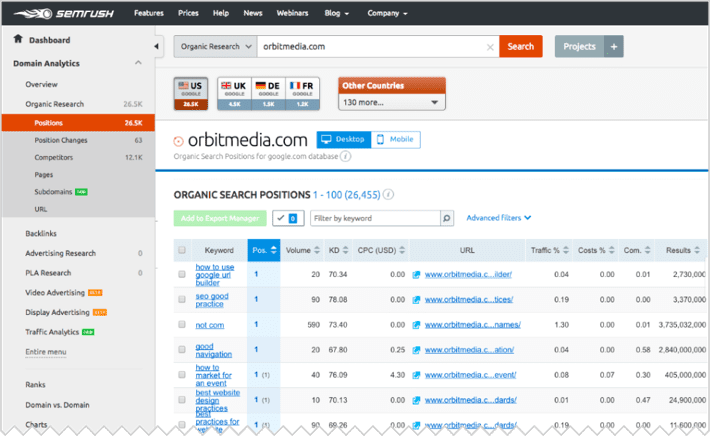 SEMrush shows both organic and paid search rankings for any site, mobile or desktop in any country. Just drop in the URL. The paid version also includes site audits, brand tracking and more. 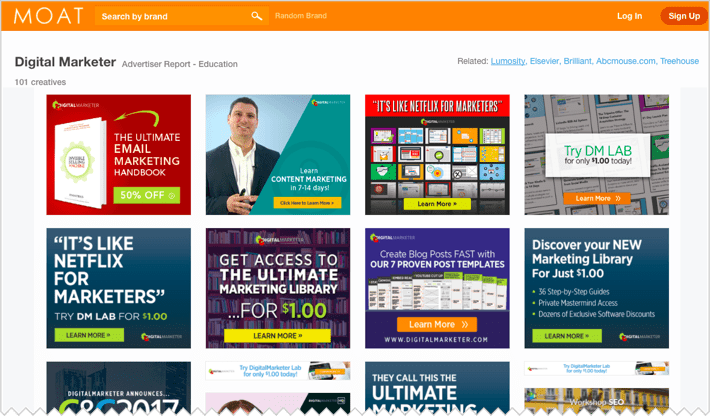 The only downside to SEMrush is that it has so many features, it takes a while to find everything! There is no free version, but you can get a 2-week free trial. Once you’re in, you’ll have access to the largest database of keyphrases of any of these analysis tools: four billion keyphrases. This is definitely a power user tool with many features beyond keyphrase tracking. Not surprising it’s #2 on Robbie’s leaderboard. Considering targeting a phrase? Ahefs provides detailed reports with search volume, projected traffic, competition and SERP analysis. Ahrefs also includes a lot of other reports for tracking keywords and links. These go beyond competitive analysis. These are power tools for serious SEOs. If search is critical to your company, you likely need these options. One of the best known competitive metrics and tools for website analysis, Alexa provides a number that some marketers obsess over. The “Alexa Rank” is an estimate of the popularity and ranking of every website globally and in every country. The paid version also has excellent tools for spying on competitors rankings. One of our favorite reports is the “Audience Overlap Tool” which first tells you which sites you compete with, then it shows you the phrases you’re competing for. It puts everything on a table. The darker table cells show who’s winning. Amazing! Alexa is also one of the only tools to estimate behavior data (bounce rate, time on site) and demographics (gender, education levels). No wonder people love it. What content management system are they using? What are they tracking? Do they use a content delivery network? What plugins are installed? Are they doing retargeting? This fast, free analysis tool shows you everything that can be learned by analyzing the code of the website. It’s a lot of information. Plug in a competitor and instantly see what software and systems they have plugged in. This gives you powerful tools into their marketing strategies. BuiltWith also has a popular (and free) Chrome extension. Just add it to your browser and see what technology is behind any website with a single click. Paid version: Starting at $495/month for Pro with unlimited results. $295 for limited results. This super popular tool is great for social listening and blog post ideas. But it’s also great for competitive research. Just drop in a competitor website and see their top shared posts on any social network for any date range. Dig deeper to see who shared it. 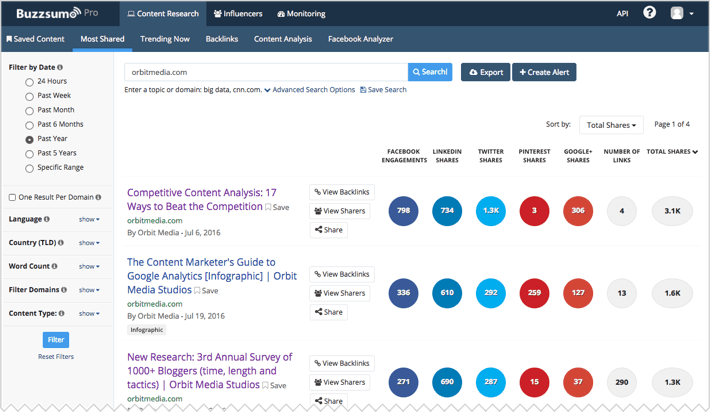 Buzzsumo tags them as journalists, bloggers and influencers. You can also see who has linked to it. Within seconds you can see who is paying attention to your competitors and which of their topics get the most love. 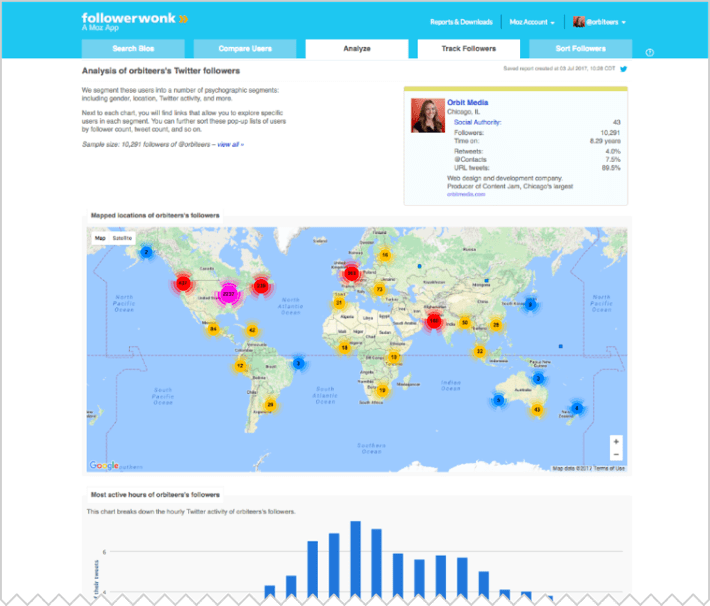 It only analyzes Twitter, but FollowerWonk is one of the best for quick analysis. It shows you where the followers are for any account, what time of day they are active, how influential a following is, etc. In the “compare users” view, you can measure the overlap between any two accounts. It also shows you which of the accounts is growing more quickly. You’ll need to create an account even to use the free version. But Ispionage does a very nice job of grouping the phrases together with the corresponding page. It also shows trends, rather than just a huge list of phrases. This makes it easy to do analysis when you’re competing for a small number of high-value phrases. See every “money phrase” their top pages rank for! It’s also easy to see what phrases that competitor website is bidding on and how those bids have changed over time. Majestic has two metrics that indicate the credibility of a domain: “trust flow” and “citation flow.” The latter is probably more relevant and accurate for most comparisons. The compare view will show you your site and anyone else’s side-by-side. Are you lagging behind in Citation Flow? Get busy doing outreach, PR and guest blogging. But first, write something worth linking to. If you know that a competitor is using display ads, this tool is a fast way to see the creative of all if their ads, all at once. Just enter the brand name and click search. This will instantly give you ideas on what kind of design and messaging might work well for you. Make sure to check the more sophisticated brands, since they are more likely to be testing for engagement and optimizing. Paid version: see placement, impressions, video ads, etc. Price negotiable. It’s a popular and powerful SEO tool with all kinds of useful reports. The one most relevant to competitive analysis is Link Explorer. This is probably the most famous tool for measuring link popularity. They use the term “Domain Authority” for their metric. It’s super easy to use. Just put in your site to see your Domain Authority, then put in a competitor. 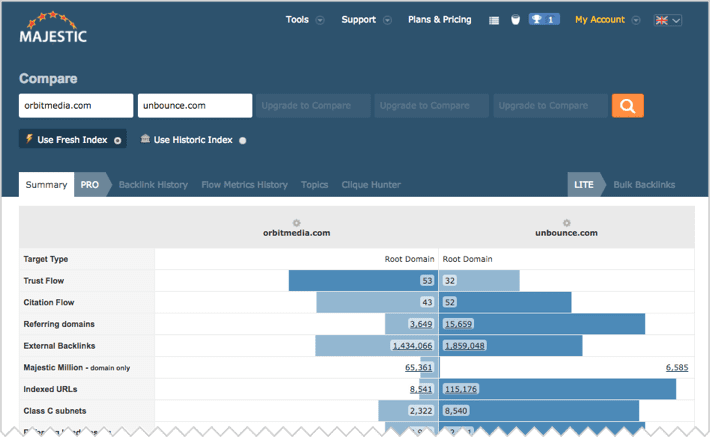 Or use the “Compare Link Metrics” tool. The site with the higher authority is more likely to rank for more competitive phrases. A few notes: Domain Authority will naturally fluctuate over time. Also, keep in mind that ultimately, it’s pages that rank in Google, not domains. So the “Page Authority” of the specific pages is even more important. To better understand this tool, read How to Increase Domain Authority. The team behind SpyFu created a new tool called Nacho Analytics. As the name suggests, these are “not your” analytics. This tool actually lets you see the Analytics data for other websites, giving you (almost) real-time answers about which landing pages convert best, which product features keep visitors on the page, or what the customer visits before they buy. The data is loaded right into your own Google Analytics account, so you can use all of the GA features. Amazing. 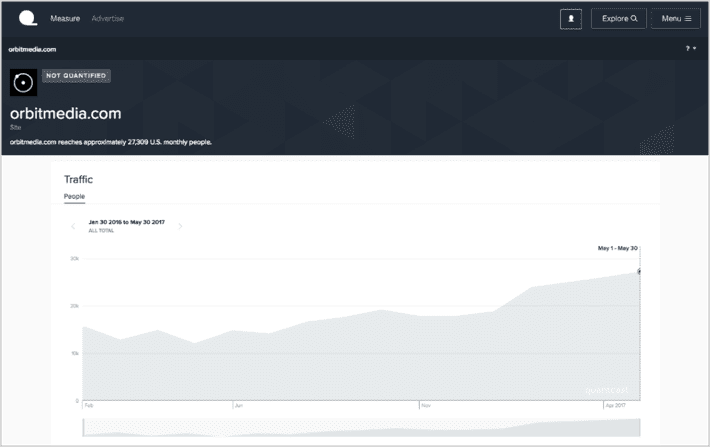 The paid version of Quantcast provides demographics, behaviors and lifestyle data about visitors across websites and apps. It’s a popular tool. 15% of the top marketing websites use the Quantcast tracking tag. The free version doesn’t give you much. But it does show traffic estimates. You’ll need to create an account, then you can see estimated traffic levels for any website in their system. This is one of the oldest and most trusted traffic estimators. 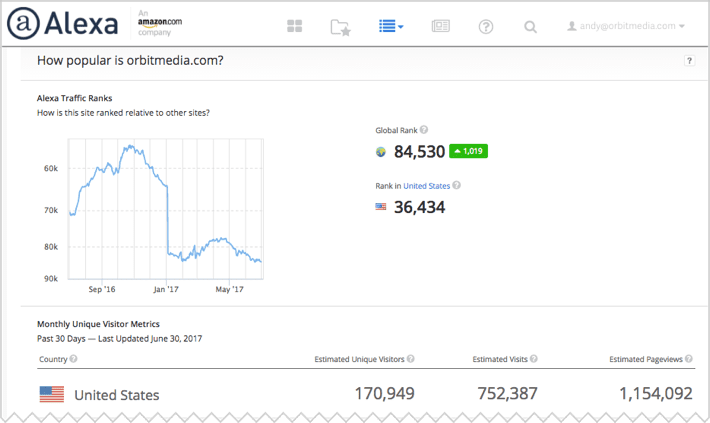 Similar to Alexa, it ranks sites globally and nationally by traffic. 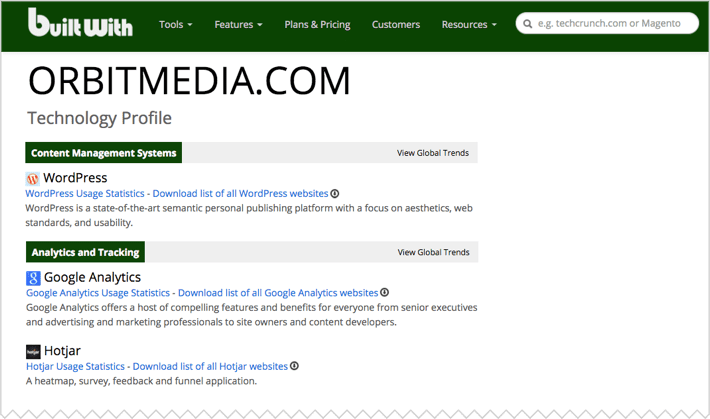 It also puts each website into a category and shows a category rank. The free version is very easy to use. It only shows the top five ranking keyphrases, so it’s not ideal for SEO comparisons. But it does show the top referring websites, which is not available in any other tool. It’s very easy to jump in and see the top phrases for any site. You can see the top five without creating an account (not very useful) or the top ten with a free account (much better). The paid version will show you everything. 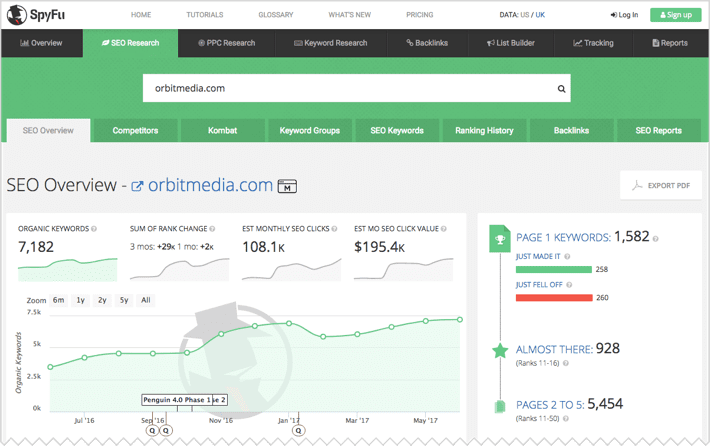 Reports are very easy to read and include PPC competitive metrics and social media competition. You’ll also find detailed information about trends and the performance of specific pieces of content. 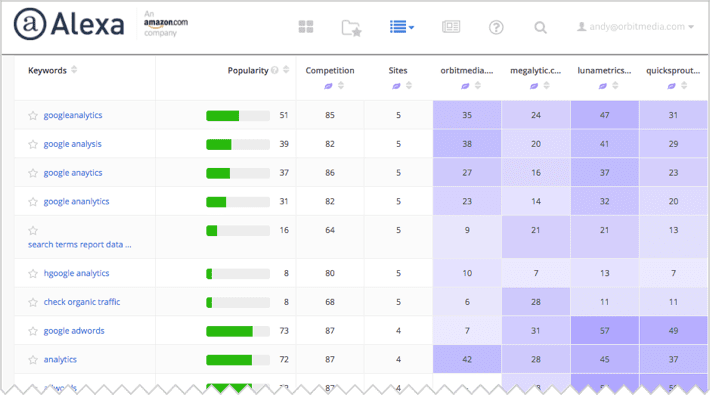 Serpstat has a lot of features related to competitor analysis. 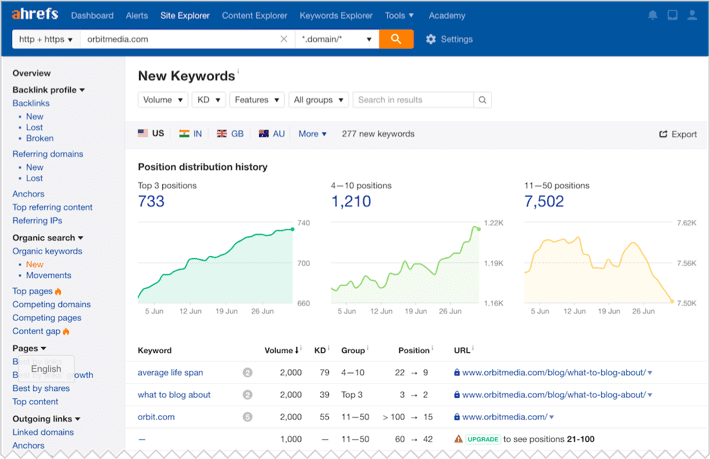 With this tool, you can get positions of competitor domains for the tracked keywords alongside your own on a daily basis. No need to create separate projects or spend your credits. As to backlink analysis, it measures Page Rank (authority based on the number of pages linking to it) and Trust Rank (trust based on how trustworthy these pages are). An interesting feature “Domain VS Domain” allows you to compare up to three websites and find unique and common keywords of each. This tool makes deeper analysis very easy. 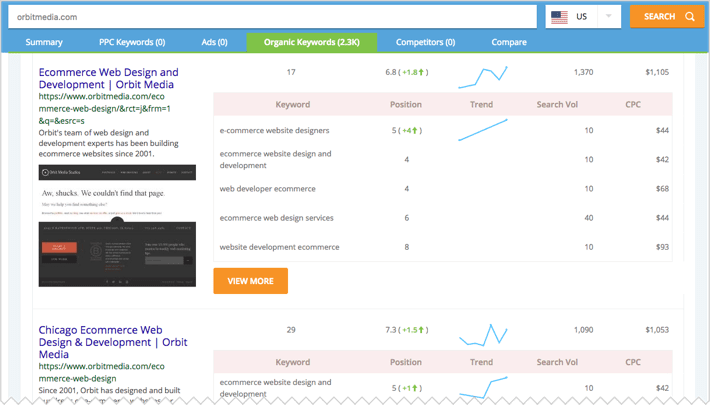 Find top organic competitors and see which phrases are ranking on page one (as well as which ones just barely made it or just fell off). There’s also a “Kombat” feature that makes it easy to compare. It’s very simple to find insights in SpyFu. 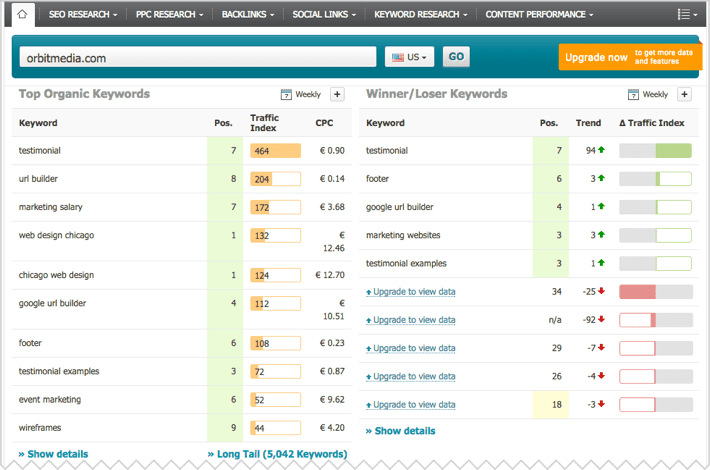 Beyond keywords, Spyfu also tracks links and PPC advertising. This is a complete tool for tracking your competitors and yourself. There you have it. Fourteen tools to snoop on the competition. Don’t pay too much attention to the other guys, but never miss a chance to find the data that can help you make better decisions. PS: I’ve once made the case that for content marketers, there’s no such thing as competition, only collaboration. If you think you’re competing with someone, you probably just don’t know them well enough. They likely have a different specialty, price point and target market. Do you have a favorite competitive analysis tool you’d like to share? Should we ignore the competition? Great tools and ideas here, Andy. Thanks for generously sharing! It’s crucial to size up competitive content on websites and in E-Commerce, social and news media to get a holistic view of what you’re up against. Andy, as always you provide so much value and clarity in your articles. Thanks Andy for the awesome list. I would highly recommend https://sitestacks.com/ as well. It is similar to BuiltWith but has a much nicer UI and is completely free. Great set of resources, they remain as relevant today as they did a year ago. Maybe even more so today. Thanks for the post. It delivers AI-generated summaries and key facts, events, IP and trademarks, relevant competitors, funding rounds and investors, news, and more. A company’s history and data at your fingertips.